This was what I said this evening at a panel at the University of Mary Washington as part of its Presidential Inauguration Week. The panel was titled "Higher Education in the Disinformation Age: Can America's public liberal arts universities restore critical thinking and civility in public discourse?" The other panelists included Steve Farnsworth (University of Mary Washington), Sara Cobb (George Mason University), and Julian Hayter (University of Richmond). I only had ten minutes, so my remarks really only scratch the surface. In February 2014, I happened to catch a couple of venture capitalists complaining about journalism on Twitter. (Honestly, you could probably pick any month or year and find the same.) “When you know about a situation, you often realize journalists don’t know that much,” one tweeted. “When you don’t know anything, you assume they’re right.” Another VC responded, “there’s a name for this and I think Murray Gell-Mann came up with it but I’m sick today and too lazy to search for it.” A journalist helpfully weighed in: “Michael Crichton called it the ”Murray Gell-Mann Amnesia Effect," providing a link to a blog with an excerpt in which Crichton explains the concept. In any case, you read with exasperation or amusement the multiple errors in a story – and then turn the page to national or international affairs, and read with renewed interest as if the rest of the newspaper was somehow more accurate about far-off Palestine than it was about the story you just read. You turn the page, and forget what you know. I remember, at the time, appreciating parts of this observation. Or at least, I too have often felt frustrated with the reporting I read on education and technology – topics I like to think I know something about. But I hope we can see how these assertions that we shouldn’t read and shouldn’t trust newspapers are dangerous – or at the very least, how these assertions might have contributed to our current misinformation “crisis.” And I’d add too – and perhaps this can be part of our discussion – that how we’ve typically thought about or taught “information literacy” or “media literacy” has seemingly done little to help us out of this mess. This isn’t just about Michael Crichton’s dismissal of journalism (and I’ll get to why he’s such a problematic figure here in a minute.) It’s the President. “Forget the press,” he said during the campaign. “Read the Internet.” It’s the digital technology industry – including those venture capitalists in my opening anecdote – which has invested in narratives and literally invested in products designed to “disrupt” if not destroy “traditional media.” Facebook. Twitter. Automattic (the developer of the blogging software WordPress). Despite the promises that these sorts of tools would “democratize” information, that the “blogosphere” and later social media would provide an important corrective to the failures of “mainstream journalism,” we find ourselves instead in a world in which institutions and experts are no longer trustworthy. And yet, all sorts of dis- and misinformation – on the Internet and (to be fair) on TV – is believed. And it’s believed in part because it’s not in print and not from experts or academics or certain journalists. I wanted to share this Michael Crichton story for a number of reasons. As I was preparing my remarks, I faced a couple of challenges. First, I couldn’t remember where or when I’d seen these tweets, although I was certain I’d first heard about the Gell-Mann Amnesia Effect from venture capitalists on Twitter. Searching for old tweets – verifying Twitter itself as a source – is not easy. Twitter’s search function offers us to “See what’s happening right now.” The architecture of the platform is not designed as a historical record or source. I guess these tweets were the conversation I saw – I spent a lot of time looking through old VC tweets from 2013 and 2014 – although my memory tells me it was Tim O’Reilly, a different venture capitalist, who’d mentioned the Gell-Mann Amnesia Effect and had caught my eye. When and if you do find an old tweet you’re looking for – as a scholar, perhaps, or as a journalist – it is stripped from its context within the Twitter timeline, within the user’s stream of tweets. 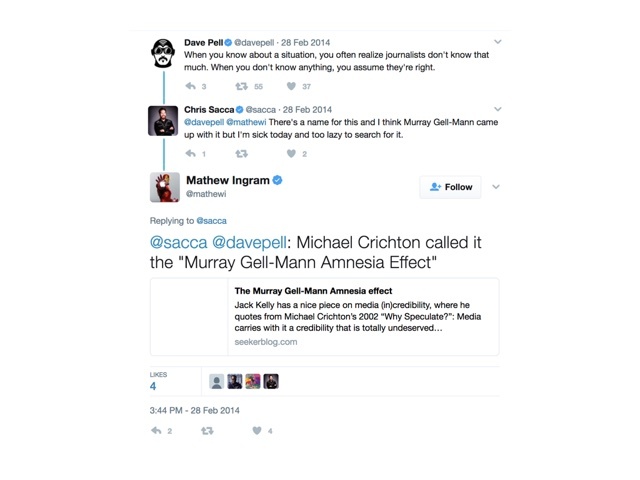 What was happening on February 28, 2014 that prompted venture capitalist Dave Pell to complain about journalism? I couldn’t really divine. In this exchange, we have a series of other Internet-based information claims. 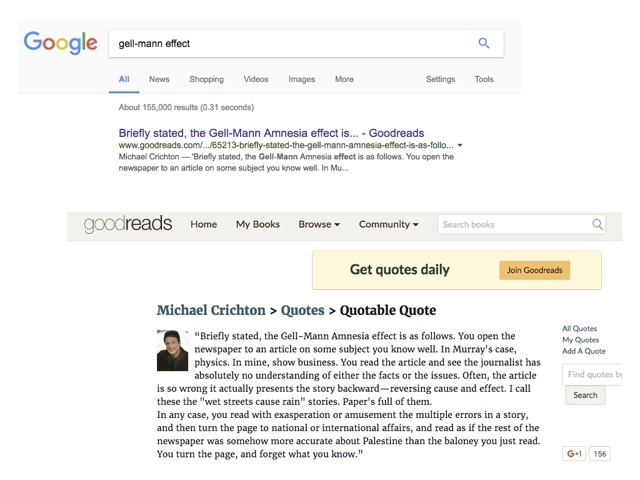 Journalist Mathew Ingram links to a blog post to explain the Gell-Mann Amnesia Effect, but if you click, you’ll find all of the links in that particular post are dead, including the one that goes to “The Official Site of Michael Crichton.” If you google “Gell-Mann Amnesia Effect,” the top search result is Goodreads, a book review site owned by Amazon. The excerpt there doesn’t give a date or a source or a link to Crichton’s commentary. The Internet doesn’t magically surface “the truth.” Its infrastructure can quite readily obscure things. You have to understand how to look for information online, and you have to have some domain expertise (or know someone with domain expertise) so you can actually verify things. Maybe you’re familiar with Crichton too, or more likely you’ve heard his name – a best-selling author; medically trained, but never formally licensed to practice medicine; creator of the TV show ER; writer and director of the movie Westworld (the one with Yul Brenner); and author of many novels including Jurassic Park, The Andromedia Strain, Disclosure, and State of Fear. 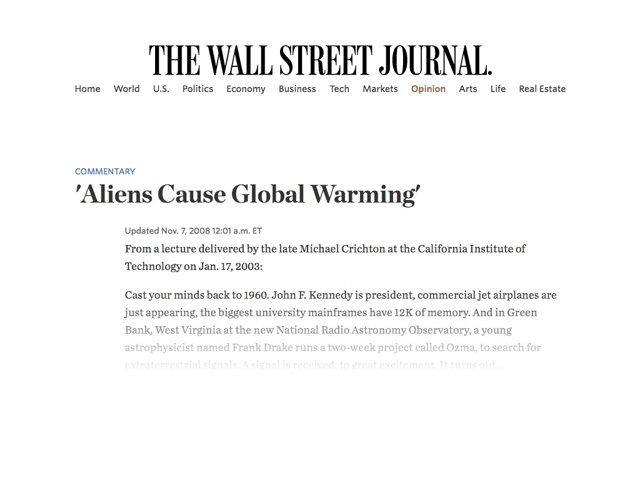 After the publication of Disclosure, Crichton was accused of being anti-feminist; after the publication of State of Fear, he sealed his status as one of the leading skeptics of global climate change. 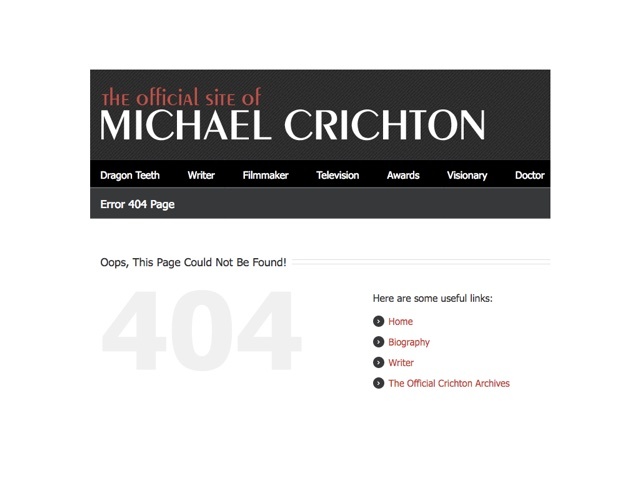 This was 2002 – Crichton doesn’t blame the Internet. He doesn’t blame the Web. He doesn’t blame Facebook. He blames MSNBC. He blames The New York Times. 2002 – A year before Judith Miller’s now discredited reporting on the weapons of mass destruction in Iraq appeared in that very newspaper. But it’s not just the media. We face a crisis in all our information institutions – journalism and higher education, in particular. Expertise is now utterly suspect. We mistrust (print) journalists – “the mainstream media,” whatever that means; we mistrust academics; we mistrust scientists. The Internet has made it particularly easy for us to confirm our beliefs and our so-called expertise. Digital technologists (and venture capitalists) promised this would be a good thing for knowledge-building; it appears, instead, to be incredibly destructive. And that's the challenge for journalism, sure. It's the challenge for universities. It's the challenge for democracy.